Game-changers like Susan B. Anthony and Gandhi teach your child it's never too early to change the world. Before they were tall enough to ride a rollercoaster, Malala Yousafzai and Martin Luther King Jr. stood up to prejudices and began to change the world. Empower your little one to do the same with this inspiring book of mini heroes. 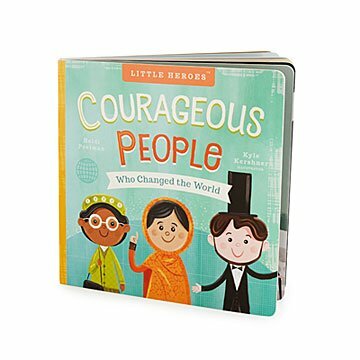 Featuring eight courageous figures from across the globe and adorable illustrations, the pages teach children a bit of history while encouraging them to be future heroes themselves. And though they have some big shoes to fill—we can't all lead the women's suffrage movement—they can join the march in their own small ways, like by being kind to every kid in their class. Made in China. Sent as a gift to a friend's child who was turning 4. Hoping it will be one he can read on his own in the near future. Content for toddlers and older, regarding relevant topics of race and justice using historical figures. I enjoyed it, and I'm sure he will too! It's a cute and informative book about inspirational people, past and present. Bought this for my niece and nephew. My SIL loved it and can't wait to use it to help instill important values. I love to read to my grandkids. This book will be fun for us to read together.